Bu araştırmanın amacı, iş birlikli yazma etkinliklerinin sınıf öğretmeni adaylarının yazılı anlatım becerilerine ve yazmaya ilişkin tutumlarına etkisini belirlemektir. Araştırmada “tek grup ön test-son test deneysel desen” kullanılmıştır. Araştırmaya Karadeniz Teknik Üniversitesi Sınıf Öğretmenliği Anabilim Dalında 2. sınıfta öğrenim görmekte olan 28 öğretmen adayı katılmıştır. Araştırmada sınıf öğretmeni adaylarına işbirlikli yazma etkinlikleri yaptırılmıştır. Adayların, uygulama öncesinde ve sonrasında yazma becerilerini belirlemek için “Yazma Becerisi Değerlendirme Formu” ve yazmaya ilişkin tutumlarını belirlemek için “Yazma Tutum Ölçeği” kullanılmıştır. Araştırmada elde edilen sonuçlar, iş birlikli yazma etkinliklerinin sınıf öğretmeni adaylarının yazma becerilerini geliştirdiğini ve yazmaya ilişkin tutumlarını olumlu yönde etkilediğini ortaya koymaktadır. Archibald, M. (2010). Perceptions of diverse first-grade learners of their writing instruction and growth as writers. Doctoral of dissertation, Walden University. Bright, R. (2007). Write through the grades: Teaching writing in secondary schools, Canada: Portage Main Press. Bruning, R. ve Horn, C. (2000). Developing motivation to write. Educational Psychologist, 35 (1), 25-37. Cutler, L. ve Graham, S. (2008). Primary grade writing instruction: A national survey. Journal of Educational Psychology, 100 (4), 907-919. Dempsey, M. S., PytlikZillig, L. M. ve Bruning, R. H. (2009). Helping preservice teachers learn to assess writing:Practice and feedback in a Web-based environment. Assessing Writing, 14, 38-61. De Smedt, F. ve Van Keer, H. (2014). A research synthesis on effective writing instruction in primary education. Procedia - Social and Behavioral Sciences 112, 693 – 701. International Conference on Education & Educational Psychology. Dobao, A. F. (2012). Collaborative writing tasks in the L2 classroom: Comparing group, pair, and individual work. Journal of Second Language Writing, 21 (1), 40–58. Dobao, A. F. ve Blum, A. (2013). Collaborative writing in pairs and small groups: Learners’ attitudes and perceptions. System, 41, 365-378. Dorn, L. J. ve Soffos, C. (2001). Scaffolding young writers. America: Stenhouse Publishers. Dyson, A. H. (1995). Writing children: Reinventing the development of childhood literacy. Written Communication, 12 (1), 4-46. Erdoğan, Ö. (2012). Süreç temelli yaratıcı yazma uygulamalarının yazılı anlatım becerisine ve yazmaya ilişkin tutuma etkisi. Yayınlanmamış doktora tezi, Hacettepe Üniversitesi, Sosyal Bilimler Enstitüsü, Ankara. Erdoğan, T. (2013). The effect of creative drama method on pre-service classroom teachers’ writing skills and attitudes towards writing. Australian Journal of Teacher Education, 38 (1), 44-61. Ferguson‐Patrick, K. (2007). Writers develop skills through collaboration: an action research approach, Educational Action Research, 15:2, 159-180. Fletcher, R. ve J. Portalupi. (2001). Writing workshop: The essential guide. Portsmouth, NH: Heinemann. Fry, S. W. ve Griffin, S. (2010).Fourth Graders as Models for Teachers: Teaching and Learning 6+1 Trait Writing as a Collaborative Experience, Literacy Research and Instruction, 49:4, 283-298. Fung, Y. M. (2010). Collaborative writing features.RELC Journal, 41 (1), 18-30. Graham, S. ve Perin, D. (2007). Writing next: Effective strategies to improve writing of adolescents in middle and high school. Washington, DC: Alliance for Excellent Education. Graham, S. ve Sandmel, K. (2011). The process writing approach: A meta-analysis. The Journal of Educational Research, 104 (6), 396-407. Graham, S., Berninger, V. ve Abbott, R. (2012). Are attitudes toward writing and reading separable constructs? A study with primary grade children. Reading & Writing Quarterly, 28 (1), 51–69. Güneş, F. (2007). Türkçe öğretimi ve zihinsel yapılandırma. Ankara: Nobel Yayın. Hughes, M. T.,Parker-Katz, M.ve Balasubramanian,A. (2013). Learning to teach literacy through collaborative discussions of student work, Teachers andTeaching: theory and practice, 19:5, 543-558. Humphris, R. (2010). Developing students as writers through collaboration. Changing English, 17 (2), 201-214. Jay, J. K. (2002). Meta, meta, meta: Modeling in a methods course for teaching English. Teacher Education Quarterly, 29 (1), 83-102. Jones, D. L., Jones, J. W. ve Murk, P. J. (2012). Writing collaboratively: Priority, practice and process. Adult Learning, 23 (2), 90-93. Kahn, J. M. ve Holody, R. (2012). Supporting field instructors' efforts to help students improve writing. Journal of Social Work Education, 48 (1), 65-73. Karatay, H. (2011). Süreç temelli yazma modelleri: Planlı yazma ve değerlendirme, Yazma Eğitimi, M. Özbay (Ed. ), Ankara: Pegem A Akademi. Karsbaek, B. (2011). Writer's workshop: Does it improve the skills of young writers?,Illinois Reading Council Journal, 39 (2), 3-11. Kolb, K.H., Longest, K. C. ve Jensen, M. J. (2013). Assessing the writing process: Do writing-intensive first-year seminars change how students write?,Teaching Sociology, 41(1) 20-31. Lambirth, A. ve Goouch, K. (2006). Golden times of writing: The creative compliance of writing journals. Literacy, 40 (3), 146-152. Lowry, P. B., Curtis, A., ve Lowry, M. R. (2004). Building a taxonomy and nomenclature of collaborative writing to improve interdisciplinary research and practice. Journal of Business Communication, 41(1), 66–99. Lin, O. P. ve Maarof, N. (2013). Collaborative Writing in Summary Writing: Student Perceptions and Problems. Procedia - Social and Behavioral Sciences 90, 599-606. 6th International Conference on University Learning and Teaching. Lundstrom, K. ve Baker, W. (2009). To give is better than to receive: The benefits of peer review to the reviewer’s own writing. Journal of Second Language Writing, 18 (1), 30-43. Martinez, I. ve Strong, W. (1994). 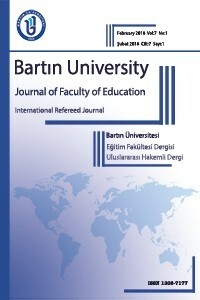 Assessing Writing Competence in Teacher Education, Action in Teacher Education, 16 (2), 28-36. McCarthey, S. J. ve Ro, Y. S. (2011). Approaches to writing instruction, Pedagogies: An International Journal, 6:4, 273-295. McCutchen, D., Covill, A., Hoyne, S. H. ve Mildes, K. (1994). Individual differences in writing: Implications of translating fluency. Journal of Educational Psychology, 86 (2), 256–266. McDonough, K. (2004). Learner-learner interaction during pair and small group activities in a Thai EFL context, System, 32 (2), 207–224. Miell, D. ve Littleton, K. (2008). Musical collaboration outside school: Processes of negotiation in band rehearsals. International Journal of Educational Research, 47 (1), 41–49. Muschla, C. R. (2006). Teach terrific writing. New York: McGraw Hill. Nauman, A. D. (2007). Writing in the primary grades: Tapping young children’s enthusiasm to help them become good writers. Illinois Reading Council Journal,35 (4), 16-28. Olive, T. (2004). Working memory in writing: Empirical evidence from the dual-task technique. The European Psychologist, 9 (1), 32-42. Phielix, C., Prins, F.ve Kirschner, P. A. (2010). Awareness of group performance in a CSCLenvironment: Effects of peer feedback and reflection. Computers in Human Behavior, 26, 151–161. Prior, P. (2006). A sociocultural theory of writing. C.A. MacArthur, S.Graham ve J. Fitzgerald (Ed. ), Handbook of writing research. New York: Guilford Press. Shehadeh, A. (2011). Effects and student perceptions of collaborative writing in L2. Journal of Second Language Writing, 20 (4), 286-305. Storch, N. (2005). Collaborative writing: Products, process, and students’ reflections. Journalof Second Language Writing, 14, 153–173. Sundem, G. (2007). Improving student writing skills. USA: Corinne Burton. Sutherland, J. A. ve Topping, K. J. (1999). Collaborative creative writing in eight year-olds: Comparing cross-ability fixed role and same-ability reciprocal role pairing. Journal of Research in Reading, 22 (2), 154-179. Swain, M. (2000). The output hypothesis and beyond: Mediating acquisition through collaborative dialogue. In J. P. Lantolf (Ed. ), Sociocultural theory and second language learning (pp. 97–114). Oxford, UK: Oxford University Press. Topping, K., Nixon, J., Sutherland, J. ve Yarrow, F. (2000). Paired writing: A framework for effective collaboration. Reading, 34 (2), 79-89. Topping, K., Smith, E., Swanson, I., ve Elliot, A. (2000). Formative peer assessment of academic writing between postgraduate students. Assessment and Evaluation in Higher Education, 25, 149–169. Vass, E. (2007). Exploring processes of collaborative creativity-The role of emotions in children’s joint creative writing. Thinking Skills and Creativity, 2 (2), 107–117. Yang, L. (2014). Examining the mediational means in collaborative writing: Case studies of undergraduate ESL students in business courses. Journal of Second Language Writing, 23, 74–89. Yarrow, F. ve Topping, K. J. (2001). Collaborative writing: The effects of metacognitive prompting and structured peer interaction. British Journal of Educational Technology, 71, 261-282. Wigglesworth, G. ve Storch, N. (2012). What role for collaboration in writing and writing feedback, Journal of Second Language Writing, 21, 364–374.